PRICE REDUCTION!! 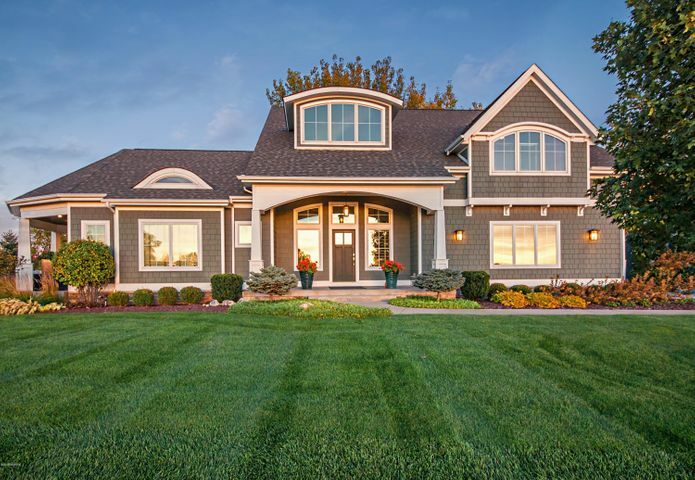 Custom home with DISTINCTIVE VIEWS of Ox Creek and the Paw Paw River combined with SUPERIOR CRAFTSMANSHIP and located on the Jack Nicklaus HARBOR SHORES Golf Course. This 4400 square ft custom home offers soaring ceilings,an abundance of windows,wood floors and very exquisite kitchen. Solar panels,geothermal HVAC,2x6 framing,and extra insulation all work together to achieve a LEED Certification making the home very ENERGY EFFICIENT. The main floor master has wood floors,luxury bath with his and hers vanities,steam shower, separate jetted tub & toilet closet. The perfect home for entertaining with 20x12 screened porch which is attached to an additional open air/covered porch. The focal point of the home is the IMPRESSIVE STAIRCASE as you enter the front door Second floor features one bedroom with dedicated suite bath and other two bedrooms share a jack n' jill bath. There is another laundry on second level. The spiral staircase extends to the lower level which has a 29x23 living area with 7 large windows allowing lots of natural light to enter the home. The entertainment area here has a bar refrigerator, ice maker, microwave & dishwasher. The 23x14 THEATER ROOM is fully equipped with sound system and projector. All of the bathrooms and laundry areas are beautifully appointed with granite and superior fixtures. Enjoy the NEIGHBORHOOD POOL in the summer months. This is an exceptional home surrounded by opulent landscaping in a very convenient location. Take your golf cart to the beach, bike to west basin & yacht club, and walk to downtown St. Joseph with numerous shops, restaurants & museums. Advertising Remarks PRICE REDUCTION!! Custom home with DISTINCTIVE VIEWS of Ox Creek and the Paw Paw River combined with SUPERIOR CRAFTSMANSHIP and located on the Jack Nicklaus HARBOR SHORES Golf Course. This 4400 square ft custom home offers soaring ceilings,an abundance of windows,wood floors and very exquisite kitchen. Solar panels,geothermal HVAC,2x6 framing,and extra insulation all work together to achieve a LEED Certification making the home very ENERGY EFFICIENT. The main floor master has wood floors,luxurybath with his and hers vanities,steam shower, separate jetted tub & toilet closet. The perfect home for entertaining with 20x12 screened porch which is attached to an additional open air/covered porch. The focal point of the home is the IMPRESSIVE STAIRCASE as you enter the front door. This is an exceptional home surrounded by opulent landscaping in a very convenient location. Take your golf cart to the beach, bike to west basin & yacht club, and walk to downtown St. Joseph!